Rising Women is rising up. 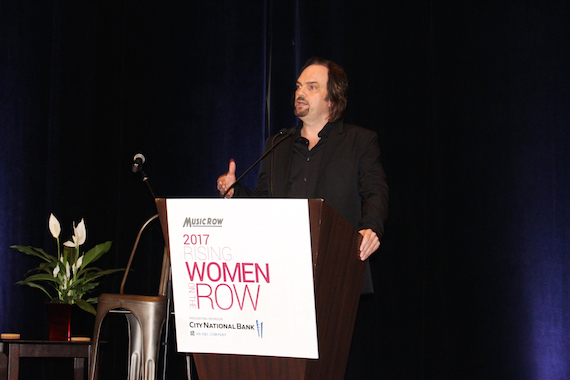 MusicRow’s sixth Rising Women on the Row celebration demonstrated that this annual event has evolved into a major date on the industry’s social calendar. It was completely sold out, with nearly 500 attendees packed shoulder-to-shoulder in the Omni Hotel ballroom on Tuesday morning (April 25). 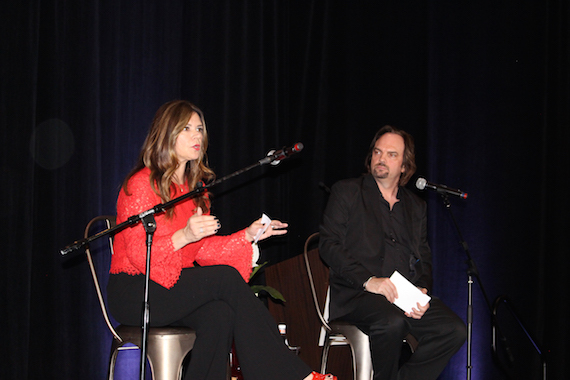 The crowd was a who’s-who of Music Row with tables sold to such power players as CAA, WME, UMG, the ACM, BMG, Sony-ATV, Black River, FBMM and presenting sponsor City National Bank. Mayor Megan Barry put it on her calendar for the first time. “Music contributes $10 billion to our economy every year, and you make it happen,” Barry told the assembled multitude. To the women in attendance, she added, “You are breaking glass ceilings. All of you are changing the profile of what little girls can be. If you can see it, be it. “I am glad that you are here supporting each other. We take conflict and turn it into conversation. And we take conversation and turn it into action,” concluded Nashville’s first female mayor. Rising Women video greetings came from such mega talents as Martina McBride, Mary J. Blige, Reba McEntire, Meghan Trainor, Britney Spears, supermodel Taylor Hill and Quantico actress Priyanka Chopra. The featured speaker was Tri Star CEO and business manager to the superstars Lou Taylor. She was ably interviewed on stage by Robertson. Each of the honorees offered words of wisdom as well. “Powering through what you do: That’s the way we do it; that’s the way we rise,” said Tatum Allsep of Music Health Alliance. “Your friendships are the greatest gifts this industry has given me,” said Laura Hutfless to the attendees. She is the co-founder of the marketing agency FlyteVu. 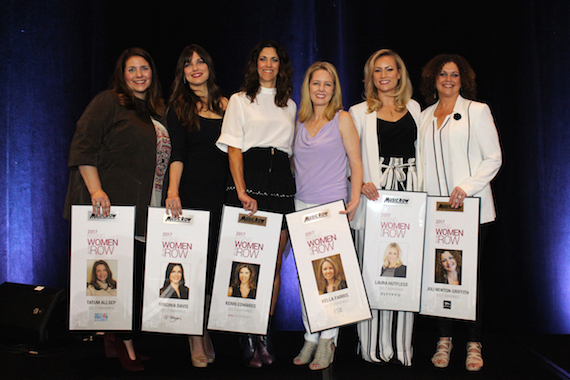 Magic Mustang/BMG publisher Juli Newton-Griffith said, “I don’t feel like I belong, but thank you for having me….with this amazing, amazing group of women. The Rising Women entertainment was music by Kalie Shorr, one of the key figures of the Song Suffragettes showcase series. This female gathering of songwriters sells out its shows every Monday night at The Listening Room Cafe. “Twenty artists have received publishing deals through Song Suffragettes, and six have gotten label deals,” said CMT’s Leslie Fram in her introduction of Shorr, who was a CMT Artist Discovery in 2016. Her third song was a brilliantly arranged mash-up of “When I Think About Angels” and “Delta Dawn.” Jamie O’Neal co-wrote and recorded the first-named hit. She joined Kalie Shorr on stage to duet on both songs. Alpha females in the breakfast crowd included Lori Badgett, Becky Harris, Alison Jones, Teri Brown, Debbie Linn, Lisa Harless, Whitney Daane, Stacy Schlitz, Judi Turner, Pam Matthews and Diane Pearson. As the years have gone by, more and more men have been coming to Rising Women on the Row. Tuesday’s appreciative and applauding attendees included Mike Dungan, Royce Risser, Dale Bobo, Troy Tomlinson, Woody Bomar, Justin Levenson, Rod Essig, Todd Cassetty, Tom Luteran and Rob Beckham. 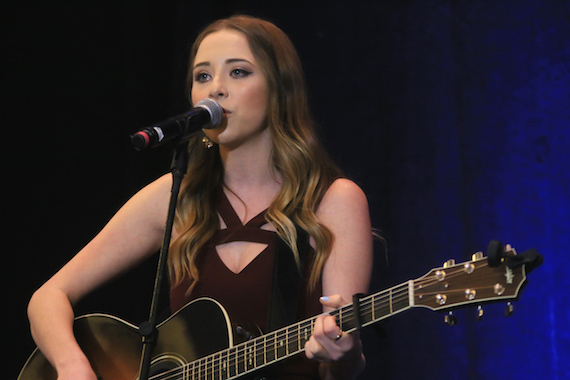 Kalie Shorr performs. Photo: Bev Moser/Moments By Moser.